SEATTLE, WASH. – Nicolás Lodeiro scored the match’s lone goal as Sounders FC (4-0-1, 13 points) earned a 1-0 shutout win over Real Salt Lake (1-4-1, 4 points) on Saturday evening in front of 37,722 fans at CenturyLink Field. The win extends the Rave Green’s unbeaten streak to five games to start the 2019 campaign, the best five-match start to a season in club history. The Rave Green now occupy second place in the Western Conference with 13 points, three points behind Los Angeles FC with a game in-hand to play. Seattle now heads into a two-match week, beginning on Wednesday, April 10 at the Colorado Rapids (7:00 p.m. PT / JOEtv, YouTube TV, 950 KJR AM, El Rey 1360 AM). 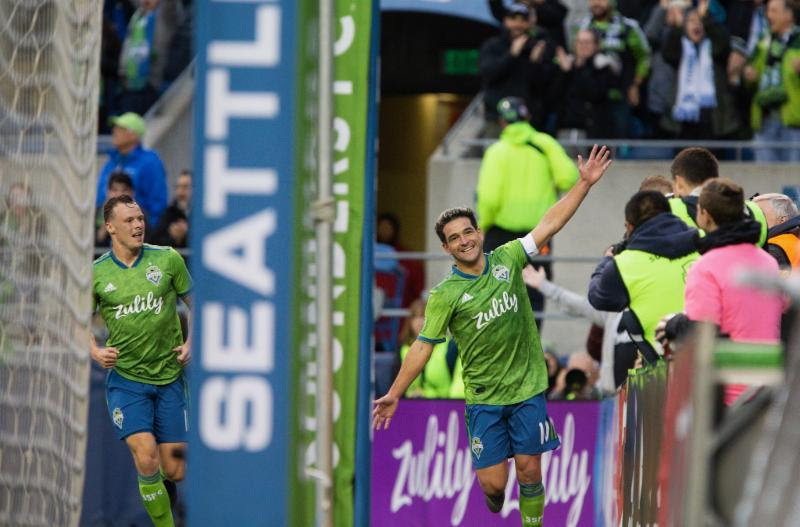 Nicolás Lodeiro celebrates his game-winning goal, which improved the team’s unbeaten streak to five games (Lindsey Wasson / Sounders FC Communications). Lodeiro put Seattle on the board first in the 18th minute with a spectacular volley inside the area on a cross from Cristian Roldan. Following an uncompleted cross from the left flank that sailed through the area, Roldan chased the loose ball down on the right side and sent in another lofted ball, this time finding Lodeiro in traffic. Falling away from the goal, the Uruguayan plucked the cross out of the air and smashed a left-footed volley inside the near post, just outside the reach of Nick Rimando. It marks the second goal of the season for Lodeiro, and the first assist of the campaign for Roldan. Following Saturday’s result, Sounders FC embarks on a two-match week, beginning on Wednesday, April 10 at Colorado (7:00 p.m. PT / JOEtv, YouTube TV, 950 KJR AM, El Rey 1360 AM). Brian Schmetzer’s side then returns home next Saturday, April 13 for its lone matchup of the season against Toronto FC at CenturyLink Field (1:00 p.m. PT / JOEtv, YouTube TV, 950 KJR AM, El Rey 1360 AM). Sounders FC improves to 4-0-1 to start the 2019 campaign, the best five-match start to a season in club history. Dating back to last season, Sounders FC is unbeaten in its last 10 regular season matches (9-0-1). The Rave Green now occupy second place in the Western Conference with 13 points, three points behind Los Angeles FC with a game in-hand to play. Brian Schmetzer’s side has two matches later this month with LAFC, first in Southern California on April 21, followed by a contest in Seattle on April 28. Sounders FC is now 10-11-4 all-time against Real Salt Lake in regular-season play, in addition to a 2-1-1 record in the postseason. Lodeiro’s 18th-minute strike was his second of the season to go along with his team-high three assists. Since joining MLS in July of 2016, Lodeiro has 21 goals and 39 assists in regular-season play, the latter of which is a league-high in that span. The assist on Lodeiro’s goal was the first of the season for Roldan. The University of Washington product has 14 goals and 17 assists in 123 career regular-season appearances, including a career-high nine helpers last season. Stefan Frei made four saves and recorded his third shutout of the season. His 69 careers shutouts rank seventh in league history.